Pinewoods Easter Egg Hunt on Saturday, March 31 at 11am. Meet in car park 3, RHS Harlow Carr, Crag Lane. �2 entry (Free for Pinewoods Conservation Group members). Looking for something to do in and around the Harrogate district from Thursday, March 29 to Wednesday, April 4? Exhibition: Silson Contemporary Gallery’s Winter Show at Harlow Oval. Until April 13. Event: RHS Garden Harlow Carr - Bath House Gallery – Textiles showcase. Browse and buy beautiful pieces made by talented local textile artists. Normal garden admission. Until April 1. Music: Acoustic Night - Live music at St Robert’s Club, Robert Street. All genres, any instrument. Open to all - performers and non-performers. Every Thursday, except third Thursday, 7.45-10.30pm. Coffee morning: Ripon Community Link coffee morning in Ripon Town Hall 10am-noon. Event: RHS Garden Harlow Carr Easter holiday fun and the Lindt Gold Bunny hunt until April 16. Easter crafts and birds-of-prey demonstrations. Normal garden admission. 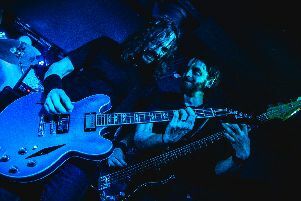 Music: Classic live rock covers from Empress at Monteys Rock Cafe, The Ginnel. 8pm. Music: Soul Lounge at St Roberts Club, Robert Street, Harrogate HG1 1HP sees the return of Soulful 8pm-midnight. Free entry. Music: Male/Female covers duo ‘Sounds Like Us’ at The Old Royal Oak, Knaresborough 8.30pm. Sounds from the 50’s onwards. Event: Churches Together Good Friday Walk of Witness starts at 11am at the Westgate car park. Cinema: Peter Rabbit - Fri-Thu: 2pm, 4.30pm. Mary Magdelene - Good Friday, Sat & Easter Sunday: 7.30pm. Lady Bird - Easter Monday, Tue & Thu: 7.30pm. The Royal Opera presents: Macbeth - Wed: 7.15pm. Visit www.wetherbyfilmtheatre.co.uk. Cinema: Ritz Cinema Thirsk - Early Man - Fri-Thur: 7.30pm. Also matinees Sat & Sun: 2.30pm. Visit www.ritzcinema.co.uk. Event: Pinewoods Easter Egg Hunt at 11am. Meet in car park 3, RHS Harlow Carr, Crag Lane. £2 entry (Free for Pinewoods Conservation Group members). Books: Authors reading/signings at Imagined Things bookshop, Westminster Arcade. 3pm - Science Fiction event with Christopher Priest, Justina Robson, Simon Modern, Alastair Reynolds and Paul McAuley. 4pm - Fantasy Event with Joanne Harris, Bradley Beaulieu, Elizabeth May and Ed McDonald. Music: Regency Live - new music night for Harrogate at The Regency pub. Modern Day Dukes (Harrogate/Sheffield), Let Man Loose (Hull) and The Omega Era (Harrogate). Doors open 7.30pm. £6 on the door. Music: Les Lomax & Re-Act At The Mill Tavern Lido Caravan Park Knaresborough. Music: The Cross keys, Cheapside - The Welsh T Band. 9pm start. Event: Whixley Easter Egg Hunt 1-4pm. Meet the Easter Bunny on the Green at Whixley Gate. Book your place by calling 07748 072795. MUSIC: BBC Breakfast stars Port Cities (Nashville meets Nova Scotia) play The Harrogate Club, 36 Victoria Avenue. 6pm. Tickets from The Club on 01423 502344/07396 047464 or Eventbrite. Music: Jazz at the Harrogate Arms has been cancelled. Music: Male/Female covers duo ‘Sounds Like Us’ playing at The Lido Caravan Park, Knaresborough 8pm. Sounds from the 50’s onwards. Music: The Cross keys, Cheapside - 4th anniversary Northern Soul disco with David Crane 4pm. Event: Newby Hall Easter Family Fun Day. Fair: Grewelthorpe Sports and Social Associations vintage collectable and craft fair in Masham Town Hall 10am-4pm. Dance: Social sequence dance in Sowerby (Thirsk) Parochial Hall 7.30-11pm. Tickets £4 on the door, bring a shared supper, soft drinks will be provided. Enquiries to Tel 01845 523743. Music: Jazz at the Empress is The Blues Dudes 8.15pm. Free entry. Sale: Jumble Sale at Woodlands Methodist Church, Wetherby Road at 1.30pm. Proceeds for Harrogate Homeless Project. Music: Chorus Choir at Valley Gardens on April 15 11am-12.30pm in support of The Friends of Valley Gardens. Books: Book signing for ‘Epitaph for the Ash: in search of recovery and renewal’ on Saturday, April 7 11am-2pm at Harrogate’s independent book shop, Imagined Things, WestminstetrArcade off Parliament Street.